This past weekend Dover, Kohl and Partners had the pleasure of attending the Sixth Annual Addison Mizner Awards held at the Colony Hotel in Palm Beach. 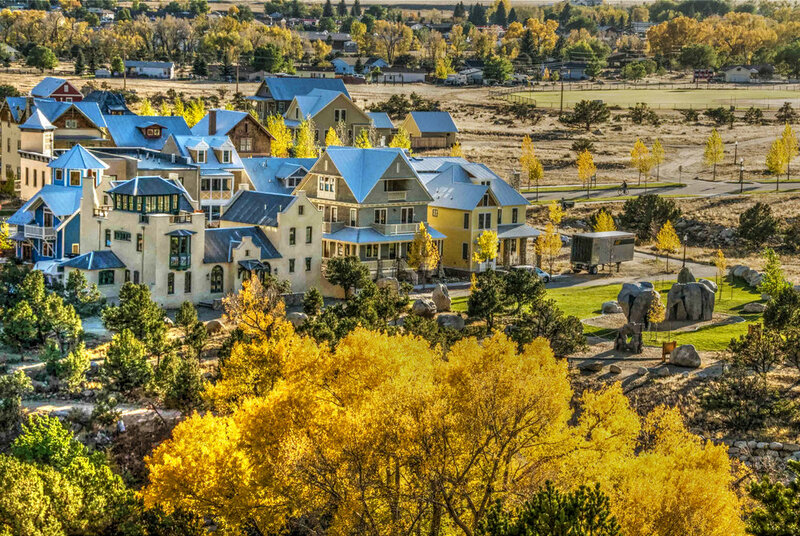 At the ceremony, principals James Dougherty and Joseph Kohl were honored to receive a Mizner Award in the Urban Design category for South Main in Buena Vista, Colorado. The South Main plan seeks to fulfill the founding developers Jed and Katie Selby’s dream of permanently and beautifully extending the Town of Buena Vista’s public access to the Arkansas River. The plan was formulated during a week-long design charrette, where local residents, town leaders, the developers, and the design team worked to form design concepts. Key ideas that were incorporated into the plan include maintaining public access to the river, creating a high-quality riverfront space, establishing visual and physical connections with Main Street and downtown Buena Vista, and creating a walkable environment through a mixture of uses and network of pedestrian connections. Today, South Main’s Riverfront Square is surrounded by mixed-use buildings and provides a gathering space for residents and visitors. Neighborhood streets are oriented to frame views to the mountains and riverfront. The developers have delivered on key principles established by residents during the charrette: maintaining public access to the river; creating a high-quality riverfront space; establishing visual and physical connections with Main Street and downtown Buena Vista including a dramatic view of the historic courthouse cupola with background mountains; and creating a walkable neighborhood through a mixture of uses, network of pedestrian connections, and human-scale streets. A Dover, Kohl and Partners team member, Adam Bonosky, was recipient in the Emerging Classicist category for his Master of Urban Design Project, Guadalupe Hirian; A New Town for Hondarribia. Situated in northern Spain, historic Hondarribia is located across the Bidasoa River from France and is host to a now defunct hilltop fort. The design incorporates methods of traditional urban design and architecture as exemplified by Camillo Sitte and Leon Krier to develop a new settlement in the tradition of hilltop towns. The plan is designed to be flexible and accommodate a variety of development patterns utilizing a series of building types that were designed based on a study of existing vernacular buildings in Hondarribia. A variety of public spaces are formed by public and private buildings, granting a mix of experiences for visitors and residents. Thanks go out to the Florida ICAA, the Addison Mizner Award Committee, and the members of the jury for their time in organizing this wonderful event.